Above (L-R): Frank Stumbo, Josh Mansfield, Coach Brent Northup, Kelsie Watkins, and Peri Dropping. 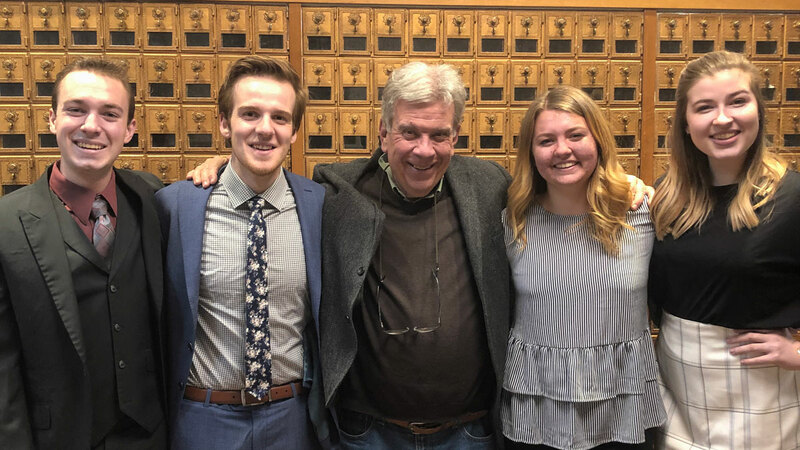 HELENA – The Carroll College Talking Saints made a deep run at the Western United States debate championships held March 23-25, sending Carroll teams to the championship final rounds in both open debate and novice debate. A third Carroll team advanced to the semifinals. The Western Championships, held at Pacific Lutheran University in Tacoma, Washington, drew more than 60 teams from 11 states and Canada. Senior Frank Stumbo from Shelley, Idaho, and sophomore Josh Mansfield, a sophomore from Pocatello, Idaho, reached the championship round, losing to Regis University of Denver. Juniors Kelsie Watkins of Snohomish, Washington, and Peri Dropping of Redmond, Washington, reached the semifinals. First-year students Eleanor Ferrone of Hastings, Nebraska, and David Lange of Ferndale, Washington, reached novice finals, losing to Vanderbilt University from Nashville, Tennessee. Ferrone was honored as the “Rookie of the Year” in the Northwest in January, given to the top novice in the region. Carroll assistant coach Mark Schmutzler of Helena and his partner Ryden Meyer from Portland won the Western championships in 2015. Next up for the Talking Saints are the national championships. Carroll’s debaters head to Clemson University in South Carolina on April 11 to compete against Stanford, Harvard, Yale and the rest of the nation’s debate powerhouses. Carroll will also compete at the National Individual Events championships at the University of Alabama on April 5-7.